OVERVIEW: The legend comes to life when one of the most successful anime franchises of all-time arrives on Blu-ray Disc with Dragonball Evolution: Z Edition, available July 28 from Twentieth Century Fox Home Entertainment. A live-action adaptation of the hugely popular franchise, Dragonball Evolution: Z Edition is a non-stop action thrill ride centered on a humanoid alien named Goku (Justin Chatwin, War of the Worlds), who tries to fulfill the wish of his dying grandfather by collecting all seven of the world's mystical Dragonballs with the help of the great Master Roshi (Chow Yun-Fat, Bulletproof Monk). It’s a race against time against the evil Lord Piccolo (James Marsters, “Buffy The Vampire Slayer”), who is trying to use the Dragonballs to take over the world. SYNOPSIS: Based on one of the most popular Japanese manga series of all time, Dragonball: Evolution follows a young warrior on an epic adventure to discover his destiny...and save the world from the forces of darkness. For his eighteenth birthday, mild-mannered Goku is given a mystical Dragonball, one of only seven in existence, which combine to grant a perfect wish to whoever possesses them. But an ancient warlord named Piccolo has escaped eternal imprisonment and is on his own quest to gather the Dragonballs. Goku must enlist the help of his friends—and the power of his evolving martial arts skills—to defeat Piccolo before it’s too late! 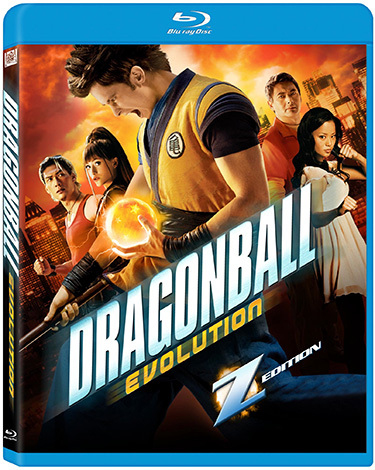 Packed with spectacular visual effects, high-flying action, and over an hour of hard-hitting extras, Dragonball: Evolution Z-Edition brings the legend to life as never before! BLU-RAY: The film is presented in 1080P widescreen with a 2.40:1 aspect ratio preserving its theatrical format. The picture is just flawless, giving the film the special effects the clarity that only high definition can provide. 20th Century Fox Home Entertainment did a phenomenal job in this transfer. Very clean! Not only the picture looks excellent in this release, also the sound it is good, a 5.1 Dolby TrueHD in English that provides a nice complement to the picture. It also includes 5.1 Dolby Digital language tracks in Spanish and French, as well as subtitles in Spanish, Portuguese, French, Cantonese, Mandarin and Korean. Overall the film provides an action roller coaster ride for fans of the franchise. Some may argue that it is not, however I have fun with it.